Davies enjoys diplomatic immunity, so even if he is found guilty of lèse majesté, he will not be tried and punished under Thai law. However, Thai authorities have hinted that the investigation will continue and that Davies could be subject to some kind of reprimand from the government. Still, it remains unclear what such a reprimand would entail. Does the investigation of the United States’ ambassador suggest that U.S.-Thai relations are deteriorating even more rapidly than some Thailand observers fear? Certainly, the bilateral relationship is at one of its lowest ebbs in years, with the Obama administration having taken a relatively tough stance against the military junta since the May 2014 coup – a stance that clearly rankles Prime Minister Prayuth Chan-ocha and many other senior Thai military leaders. 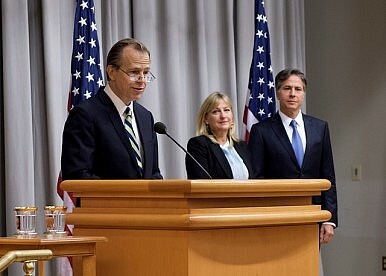 For example, even though the junta has cracked down hard on public protests in Bangkok, it has allowed a group of conservative, royalist demonstrators to gather in front of the U.S. embassy, holding profane signs and launching profane chants against the United States and the U.S. ambassador. The fact that these royalists are allowed to protest, in the heart of Bangkok, suggests that at least some members of the junta are extremely angry with the White House’s cooler approach toward Thailand. But the investigation into Davies also highlights another significant problem in Thailand today – even the royalist, authoritarian government is increasingly losing control of how the lèse majesté law is applied. To be sure, the Prayuth government appears to be using the law to stifle some forms of dissent, according to numerous human rights groups. But it is not always clear that the government wants all the lèse majesté cases to go forward. Although the law supposedly protects the king and other top members of the monarchy (even though the king himself has publicly questioned whether he should be above criticism), anyone can file a lèse majesté claim against anyone whom they believe has somehow damaged the Thai monarchy under the law’s vague clauses. In recent years, many private Thai citizens have launched lèse majesté claims against other Thais, and against some foreigners. In fact, the number of lèse majesté cases has jumped over the past decade. Since the May 2014 coup, Thailand’s military courts, which have taken over most of the judicial proceedings and which apparently want to appear as protective as the monarchy as possible, have been issuing the harshest sentences for lèse majesté in modern Thai history. In the Davies case, it appears that the case was initiated by a private citizen, a known arch-royalist. Since Prayuth’s government’s legitimacy is based in significant part on its vow to protect the monarchy and – though this part is left unsaid – oversee a peaceful and orderly transition to the next king, it can hardly ignore lèse majesté claims. The government cannot ignore lèse majesté allegations even if those claims appear pointless or potentially detrimental to Thailand’s strategic interests. In other words, an arch-royalist government led by a military man cannot even dictate how the lèse majesté law is utilized, a sign of Thailand’s increasingly out of control politics.